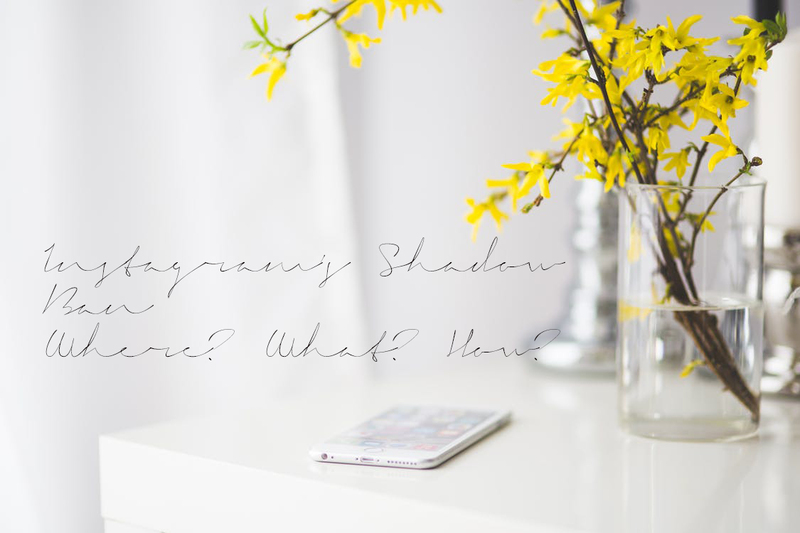 Instagram's Shadow Ban; What? Where? How? Slowly the news has been circulating about Instagram's latest addition that is making bloggers and Instagrammers everywhere go into meltdown as another spanner is thrown in the works for those trying to improve their engagement, and leaving them asking why the world is so damn hard? After already implementing plenty of other changes to their algorithms lately which has seen people already notice massive drops in their engagement, Instagram has decided to keep the ball rolling on this one and pop something else in there. It's called a Shadow Ban; the name itself even sounds shady and uncertain. Wondering what the hell this Shadow Ban is all about, if it may be affecting you and what you can do about, read on my friend. W h a t T h e H e l l I s T h i s ? The most important and puzzling question circulating at the moment is, what the hell does a Shadow Ban mean. Is it serious or not? Basically if you have a shadow ban imposed on you, your hashtags won't be discoverable. Don't really know what that means either? If, for example, you post a photo and include in the caption #fashion, but you've had a shadow ban put on you for this hashtag, your photo won't show up in the endless scrolling feed of photos that appear to people when they search that hashtag, unless they are already following you, meaning it becomes very hard for you to reach new people and new potential audiences. You don't receive any sort of notification if this has happened to you, hence the word 'shadow' in the name. The idea is to filter out trolls, bots and other nonsense accounts, but the problem is it's also attacking legit accounts. B u t H o w D o I K n o w ? If you've started to notice a bit of a drop in your engagement, the comments and likes on your photos seem to be decreased from what they usually are, if your follower count is no longer going up like it once was, or the only people who seem to be liking your pictures these days are those who already follow you, it's possible a shadow ban has been thrown your way. The most effective way to check whether you've been hit with a shadow ban is to get some friends on board to help. Get friends following you to first check that your images are appearing with a certain hashtag. Get them to then unfollow you and check again. To make this easy, try posting an image or finding an old image with a hashtag that isn't used to regularly by people so your friends are stuck scrolling through millions of images trying to find you. If absolutely nothing shows up for multiple people once they've unfollowed you, it's very possible you're under a shadow ban. If some people are seeing your image and others aren't, then it's more likely you're dealing with a hashtag glitch (see below). W h y M e ? ! There a couple of possible reasons why your account has been hit with a shadow ban, some of which may be intentional and others which you may not be aware you're doing. The way these various services work is quite spammy. They can be following and unfollowing people regularly or liking an excessive amount of posts. These types of services actually go against Instagram's Terms of Service, and are quite noticeable because one minute your IP address will say you're located where you live, next it might seem to be on the other side of the world as the service takes over your account. There are actually limits on how many likes, follows and unfollows you can do in an hour on Instagram. When you hit the limit you will receive a notification about this, but doing it continually could cause a shadow ban to be thrown on you. For future reference, you can only unfollow/follow 60 people, like 150 pictures or comment 60 times in an hour before you hit the limit. If you're always using the same hashtags on many of your photos, Instagram might have viewed this as spam activity and therefore put a shadow ban over on you. This can be annoying, especially if you're a blogger in a certain niche and you're trying to reach others interested in that area. Broken hashtags are basically Instagram's way of trying to restrict the amount go R18 content that is floating around on the platform. If a certain hashtag has been overrun with this type of content it becomes 'broken', and if you're posting regularly with this hashtag, the platform may think you're trying to add to this pile of R18 content and shadow ban you. To check if any hashtags you're using have become broken, search the hashtag and if there isn't any 'top posts' section, you can't scroll past the first page of pictures and/or there is actually a note about that hashtag being abused, then it's very likely a broken hashtag which you should avoid using in the future. H o w D o I F i x T h i s ? So at this point you're pretty certain your account has a shadow ban on it, what do you do? Slow down your activity; take a little break on the liking, following and commenting. You might need to do this for a couple of hours or days depending on your situation. If you've realised you've got some broken hashtags on your photos, just edit the captions and remove them, and this may help with the issue. If that broken hashtag also doesn't have any sort of message about it being abused when you search it, report it yourself. If you think you've been unfairly given a ban, try reporting the problem to Instagram yourself. Instagram is notorious for being hard to get into contact with for matters such as this, but trying to do something is better than nothing at all. S o m e t h i n g t o N o t e . .
Quite expectedly, there has been an uproar over this ban, and Instagram hasn't completely sat in the corner in silence while people make a fuss. They did release a very short statement saying "We understand some users have experienced issues with our hashtag search that has caused posts not to be surfaced. We are continuously working on improvements to our system with the resources available". What the entirety of this statement indicated was that in some instances you may simply be facing a hashtag glitch rather than an actual Shadow Ban (see difference above).